After searching the home of those behind Wednesday’s mass shooting incident in San Bernardino, California, police have found large stockpiles of weapons, ammunition, and explosives. 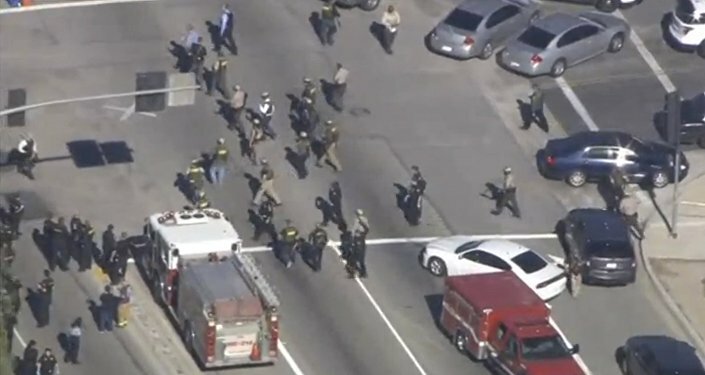 Details are slowly emerging about the couple responsible for the mass shooting at a developmental disabilities center in Southern California which left 14 people dead and another 21 injured. After searching the residence of 28-year-old Syed Rizwan Farook and his wife Tashfeen Malik, 27, police have uncovered an alarming weapons stash. According to San Bernardino Police Chief Jarrod Burguan, authorities discovered 2,000 9mm rounds, over 2,500 223 rifle rounds, and “several hundred” 22-calibre rounds. These are in addition to the 1,600 rounds which the shooters had with them or in their vehicle on Wednesday. Police also found "12 pipe bomb like devices" in the home. Three additional pipe bombs were left at the scene of the shooting, rigged with remote-control devices that evidently malfunctioned. "There were also hundreds of tools, many of which could be used to construct IEDs or pipe bombs," Burguan told reporters. "Clearly they were equipped and could’ve continued to carry out another attack." Born in the United States, Farook worked at the San Bernardino County Public Health Department for five years. In an online dating profile uncovered by the authorities, he described his family as a "religios [sic] but modern family of 4." "I try to live as a good Muslim," Farook wrote in another dating profile. "Looking for a girl who has the same outlook, wear hijab, but live the life to the fullest." Police remain unclear about Farook’s marital status, but have confirmed that he was in a relationship with the second shooter, Malik, who came to the US on a Pakistani passport last year. She is also believed to have lived in Saudi Arabia. The two had a child together, who was in the care of Farook’s mother as the attack was carried out. Witnesses say Farook was present at the Inland Regional Center earlier on Wednesday, but left suddenly. He returned half-an-hour later with Malik, both heavily armed and wearing ski masks and body armor. The pair then opened fire. The couple fled the scene in a black SUV, and were later located by authorities, resulting in a shootout which left both of the attackers dead and two police officers wounded. Officers unleashed 380 rounds of gunfire, while Farook and Malik fired 76 rounds. Investigators have not determined a motive for the shooting at this time. "There was obviously a mission here, we know that," FBI official David Bowdich told reporters on Thursday. "We do not know why. If this was the intended target, if there was something that triggered that, we just don’t know." Hussam Ayloush, executive director of the Council on American-Islamic Relations, also released a statement after speaking with Farook’s family. "We don’t know the motives. Is it work-related? Is it mental illness? Is it extreme ideology? At this point, it’s really unknown to us, and at this point it’s too soon to speculate," he said, according to the Associated Press.